Reigning Motul Pirelli Australian Superbike Championship (ASBK) Supersport 300 champion Tom Bramich is chasing his dreams in Europe this year as he begins his assault on the 2019 FIM World Supersport 300 Championship with Carl Cox-RT Motorsports by SKM-Kawasaki. We join Tom from his new home in Wales where he has just arrived after a visit to the paddock at Phillip Island for Round 1 of the ASBK and Round 1 of the FIM World Superbike Championship. 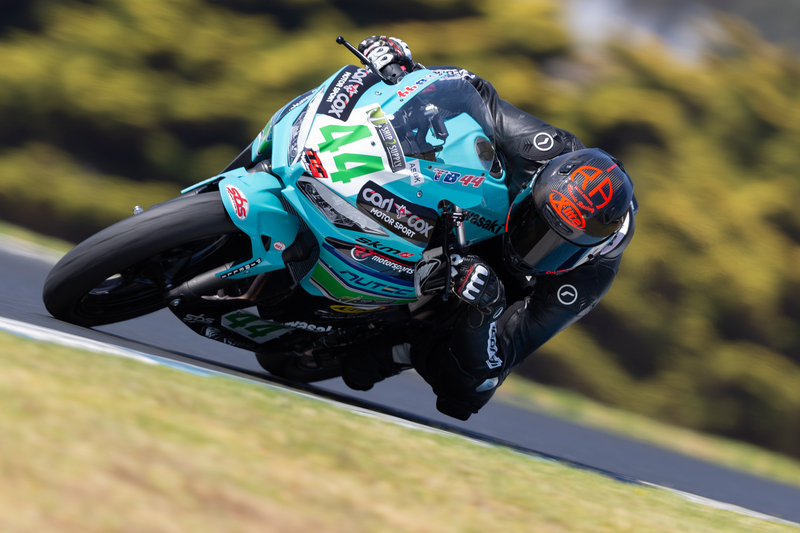 He shares his thoughts on Round 1 of the ASBK, how he’s settling into his new home and updates us on his preparation for the coming year. What an awesome start to the ASBK! The Kawasaki Superbike category is insanely tough this year, with the top 20 in the field all top-class riders, and the Supersport and YMI Supersport 300 classes also very cut-throat . It was weird watching all the riders that I’ve raced against for a long time out on track while I spectate. I’m not a good spectator, but the racing was extremely entertaining and great to watch. It’ll be interesting to see the results at Wakefield Park through testing and then Round 2 at the end of the month (March 22-24). I’ve arrived at my new home in Holywell, North Wales where I’ll base myself along with British Superbike rider and Kawasaki stablemate Ben Currie. It’s a country town, with awesome mountains and rolling countryside. Perfect for plenty of running and cycling training sessions. There’s a big mountain bike community in Wales, so I’m looking forward to getting stuck into that. On the 14th of March I fly to Bologna where I’m on track in Misano followed by Aragon, Jerez and Portimao, but the anticipation is killing me. Looking forward to getting to know the team and the bike in the coming weeks, I’m already buzzing! Tom Bramich on stage with Emma Notarfrancesco at his fundraiser for his 2019 World Supersport 300 campaign last month.